I’ve been a space nut for years. if there’s a new film or documentary out about space? I’ve seen it. A New Book? I’ve read it. I’m particularly interested in the early years of spaceflight, the Mercury, Gemini, and Apollo era. There’s just something about that pioneering time that fascinates me. I discovered Space Lectures about 18 months ago when I was idly searching for information on when astronauts might come to the UK to give talks. Years before I had seen Alan Bean talk in London and I was keen to hear from any others; especially given the fact that these veteran astronauts were not getting any younger! Space Lectures are a registered charity who arrange space & astronaut related events. I quickly signed up (and you have to be quick as they are in high demand) to talks by some of my heroes; Apollo 13’s Fred Haise, and then, the following year, the legend: Jim Lovell. 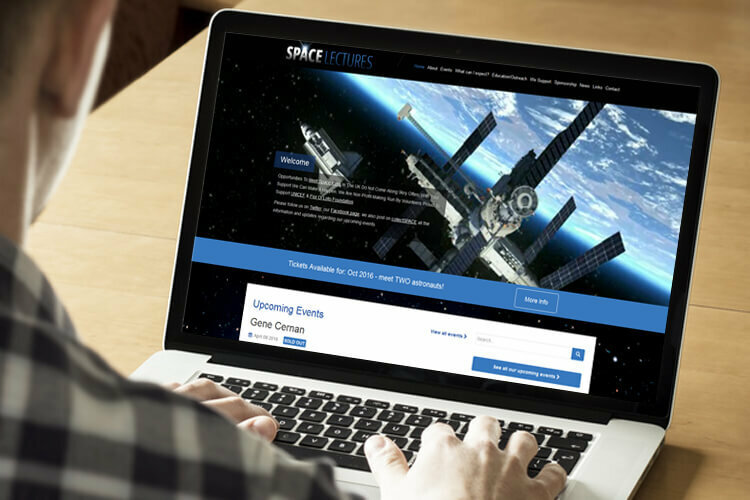 Space lectures are based in Yorkshire but with online sharing tools etc, geography does not have to pose any problems to a remote, website development project. It did also help that Julie & Rick (from Space Lectures) were superb people to work with; great at supplying the content & ideas which the website would need. I’m very proud of the whole GM team who were involved in this project (Mike, Tim, Ben), they really made it all happen. We even had our own ‘Apollo 13’ moment when the decorative video we had introduced onto the homepage was proving problematic on a certain, older web browser configurations. However, technical process and procedures allowed us to ‘work the problem’ and ‘not make things worse by guessing’. Good work, team GM!